So this is turning into a Dark Matter OTK deck, huh? Expected that since my friend runs Hieratics but didn't think it would mesh well since both Dark Matter and Twin Burst only have 2 attacks on monsters, not direct ones. It's turning into that... for now. With the additional support in the coming (both from Shining Victories and Dark Side of Dimensions), it will probably take another direction. Leo will be replaced by Nirvana High Paladin. 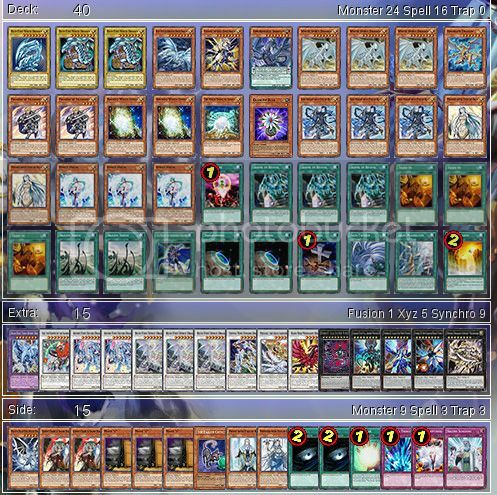 And I'm looking forward Neo New Blue-Eyes Ultimate. Let's hope it will make Blue-Eyes Shining at least Side deck worthy. EDIT: Since Neo BEU's unconfirmed effect have been revealed.... I'm not considering using him in the deck. Last edited by Indytotof; 23rd March 2016 at 08:57 AM.